North Anna facility, located seven miles from the quake's epicenter, is now relying on back up diesel generators to keep spent nuclear fuel cool. NEW YORK (CNNMoney) -- Two nuclear reactors at the North Anna power plant outside Richmond, Va. have shut down as a result of the earthquake Tuesday, the Nuclear Regulatory Commission said. 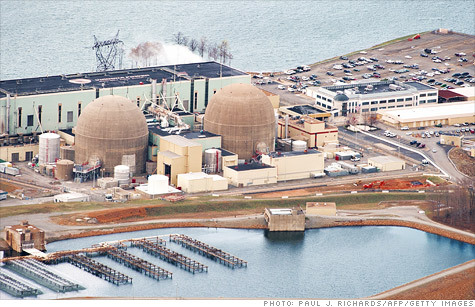 Twelve other nuclear power plants in New Jersey, Virginia, Pennsylvania and Maryland have also declared unusual events but have not shut down, the NRC said. The shutdown at the North Anna facility was automatic, an NRC spokeswoman said, triggered by a 5.9 magnitude earthquake. The plant is located just seven miles northeast of the quake's epicenter in Mineral, Va. It is 40 miles from Richmond, Va. and 70 miles from Washington, D.C.
Two other plants are located within 100 miles of the epicenter -- Calvert Cliffs near Lusby, Md., and Surry near Williamsburg, Va. Those plants have not reported any problems. The reactors at North Anna are now relying on power from four back-up diesel generators to run basic plant functions, the NRC spokeswoman said. Those functions include running pumps that keep spent nuclear fuel stored at the plant cool. The power plant is shut down and in a safe condition, a Dominion Resources (D, Fortune 500) official and the Louisa County public information office told CNN. There has been no release of nuclear material, Louisa County spokeswoman Amanda Reidelbach said. A disruption of offsite power, not an unheard of event, is one of the biggest fears for critics of nuclear power. Power is needed to circulate water that both cools the rector core and the spent fuel, which lies near the reactor in specially-designed pools. It was the loss of power at Japan's Fukushima Daiichi plant, not the tsunami itself, that ultimately led that plant to meltdown. The flooding prevented backup generators from working. The NRC spokesman said all four diesel generators are working properly at the North Anna facility. When offsite power is lost, nuclear power plants can usually rely on backup diesel generators for several days, although offsite power is normally restored within hours.